Tuesday December 4, 2018 from 12:00 p.m. – 1:30 p.m.
Speaker’s Lounge CB-216-N, Centre Block, Parliament Hill, Ottawa, Ontario. Historically, children have been ‘therapeutic orphans.’ Many drugs have not been studied or labelled for use in children and adolescents. This has led to unnecessary risk of harm to the millions of children who need medicines each year. Networks have developed in the United States and Europe to enhance drug research for this group, while no comparable evolution has occurred in Canada. Improved research involving this critical population will be an important step to reducing inequities in health and improving the evidence base that informs paediatric medical practice. Children who are ill need treatment that is appropriate for their age and the stage of their developing minds and bodies. Children’s Healthcare Canada is a national association representing health service delivery organizations serving children and youth across the continuum of care. Our membership includes tertiary acute care centres (children’s hospitals), rehabilitation and community hospitals serving children, home care and palliative care provider agencies. Through purposeful partnerships, we advance excellence and innovation in health systems caring for children and youth. The Paediatric Chairs of Canada represent the Departments of Paediatrics within the seventeen Canadian medical schools. 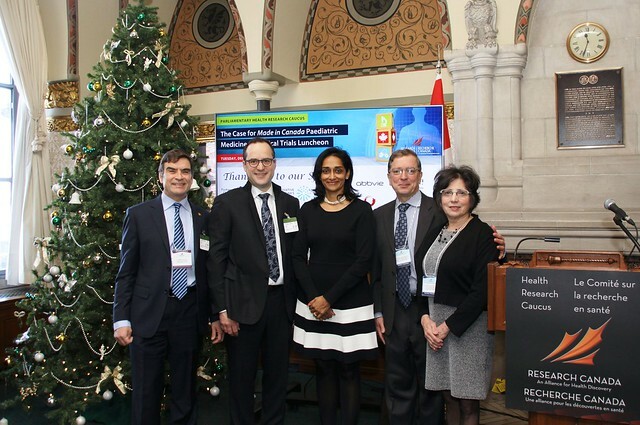 The Paediatric Chairs provide national leadership in research and education to promote the health and healthcare of children and youth in Canada. Dr. Cheryl Rockman-Greenberg is a pediatrician and a geneticist. She is a clinician scientist in the Children’s Hospital Research Institute of Manitoba, in Winnipeg, and Distinguished Professor, University of Manitoba. From 2004-2014 she served as Medical Director of the Child Health program and Head of the Department of Pediatrics. Her research is focused on identifying the cause of genetic disorders seen in Manitoba. Then working with patient groups, communities of interest, and through clinical trials, her research findings are translated into programmes relevant to patient care. Dr. Thierry Lacaze-Masmonteil is a professor and neonatology section head in the Department of Pediatrics at the University of Calgary, and past chair of the CPS Fetus and Newborn Committee. His research interests include the evaluation of new or existing drugs in neonates and evidence dissemination. As the scientific director of MICYRN and KidsCAN Trials lead, he is steering the development of a national infrastructure to support clinical investigations with an emphasis on multicentre clinical trials. Dr. Parekh is Associate Chief, Clinical Research, and Senior Scientist at the SickKids Research Institute; and Professor of Paediatrics and Medicine in the Depts. of Paediatrics, Medicine, and Epidemiology at UofT. Dr. Parekh is an international leader in clinical epidemiology and translational research in kidney disease. Her body of work has revealed novel genetic risk factors leading to kidney disease, and increased risk of morbidity and mortality for children and adults with kidney disease. CHEO Research Institute coordinates the research activities of CHEO and is affiliated with the University of Ottawa. We conduct innovative research in a dynamic learning environment and translate that knowledge into practice and policies to improve the health of children, youth and their families. In the past year alone, our researchers made more than 535 discoveries. Pfizer Canada ULC is the Canadian operation of Pfizer Inc., one of the world’s leading biopharmaceutical companies. Our diversified health care portfolio includes some of the world’s best known and most prescribed medicines, vaccines, and consumer health products. Every day, Pfizer Canada employees work to bring therapies to patients that significantly improve patients’ lives. We apply science and our global resources to improve the health and well-being of Canadians at every stage of life. Our commitment is reflected in everything we do, from our disease awareness initiatives to our community partnerships.